A surety bond is a three-party agreement between a contractor, an obligee and a bonding company. The surety bond protects the obligee against losses resulting from the contractor's failure to meet an obligation of the terms of the contract agreement. EasyInsure provides surety bonds across Canada and our mission is to provide the right bond at the right price. The EasyInsure bonding specialists will design a tailored bonding package for your organization and will negotiate on your behalf with the bond underwriters in Canada. While we offer a wide range on bonding services, we specialize in emerging and small business bonding for small contractors and First Nations Contractors. We have insurer partners/ surety companies and underwriting mechanisms that no other bond brokerage has access to in Canada. Let the EasyInsure experts help you today. A bid bond is a form of bond which may be required in order for a contractor to submit a bid under a public tender. In some cases a formal bond is to be issued by a surety company, typically in an amount of 5% or 10% of the expected contract amount. In some other cases there may be the option of a surety company issued bid bond or a cash bond. In a few cases, only a cash bond may be acceptable. A performance bond is a form of contract surety bond which may be required in support of any type of contract. The majority of performance bonds are issued on behalf of construction industry contractors in support of contracts they wish to enter into with various government related or institutional organizations. Various large commercial concerns and financial institutions may also require performance bonds. While contracts requiring bonding are most commonly related to construction projects, performance bonds are frequently required in support of contracts for the supply of materials, services, labour and products of many kinds. A Labour and Material Payment Bond is a form of contract surety bond frequently required along with a performance bond. This bond will be underwritten as part of the performance bond submission and guarantees that all your subcontractors and material suppliers will be paid as required under your contract. Please note that the labour and material payment bond is for the protection of your customer and your sub-contractors and suppliers and does not discharge your company from its legal obligations under the contract. 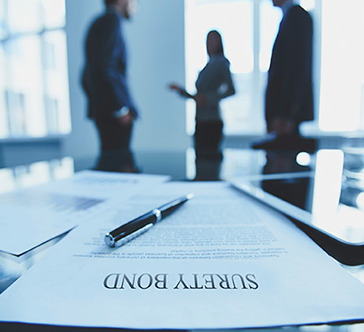 A Consent of Surety or Agreement to Bond, is often required at the tendering stage of a contract in conjunction with or as a substitute for a bid bond. This form of document will specify, under seal, that a surety company has obligated itself to issue performance bonds and other forms of security (eg. labour and material payment bonds, maintenance bonds) in support of a contractor should it be successful in its bid and called upon to enter into a formal contract. It should be noted that the requirement for a consent of surety/agreement to bond may sometimes appear as a "letter from the surety company" or similar in tender documents. At other times the requirement may be simply for a prequalification letter from the surety company which is a much less formal matter. A consent of surety/agreement to bond is a bond and as such places a legal obligation on both the surety company and the company submitting the tender bid. Customs and excise bonds are for the benefit of federal and provincial governments and guarantee that either duties or taxes will be paid by the principal to the government. These bonds ensure that companies comply with all legal and tax requirements related to their business. Operations involved in import, export, sales or distribution of goods in Canada may require a customs and excise bonds. We offer the following customs & excise bonds in Canada. License and permit bonds are required by federal, provincial and municipal governments to guarantee compliance with bylaws and regulations relating to a specific license or permit. Essentially, these bonds ensure that a business or individual meets all government rules and regulations. Governments regulate these types of businesses and operations to protect the public against incompetence, physical damage, bodily harm, fraud, or misrepresentation. We offer the following license & permit bonds in Canada.